The PaK 40 anti-tank gun was the latest generation of anti-tank weapon - a 7.5cm calibre gun to replace the 5cm PaK 38. Adopted in 1940, it only actually appeared on the battlefield in late 1941, but very quickly proved it could deal with even the heaviest Soviet tanks of the day. Indeed it could cope with almost any allied tank of the whole war, and was widely recognised as one of the best anti-tank weapons of its day. Over 23,000 were built, and by 1943 it made up the bulk of the German anti-tank arsenal, with many still serving in various armies after the end of the war. Such a famous weapon has of course been produced in model form many times, including several 1/72 scale plastic kits. Indeed two of these have been reviewed on this site (see links at bottom of page), so this model enters a very crowded market. Each gun is made up of just nine parts, so clearly it cannot hope to be as detailed or sophisticated a kit as some already available, but that is not the point. The gun goes together very easily and this is basically an easy-build kit, allowing you to build as many guns as you need very quickly. Of course detail has been sacrificed to some extent but given the small number of parts this is still a remarkably good-looking model which is likely to be more than adequate for most needs, particularly for wargamers. However the shield does seem a little too far forward and the wheels are placed too far back, although as we do not pretend to be expert on such things we leave it to the reader to judge the accuracy of the gun. The nice hard plastic is easy to work with and all the parts fit together well, mostly without the need for glue. Other kits offer better detail and more involved construction but for a good looking gun that is quick to build this is fine. The real joy of this product is the decent number of crew figures (although someone really ought to tell Italeri they are not called 'servants' in English). The poses pretty much speak for themselves, with several passing ammunition and two actually interacting with the gun. Not having actually served this gun we do not know exactly what the two gunners are doing, with the middle figure in the second row being particularly mysterious with a badly formed left hand (a peg?) and a wheel in the right. He is in a sitting posture - presumably sitting on the trail, and is probably aiming the gun by turning the wheel. It should be noted that the gun was loaded from the right, so the kneeling figure apparently loading the round should be doing so to his right - the mirror image of the actual pose. The last figure is the officer in charge of the piece, holding binoculars and with a pistol on his hip. Finally there is a useful open box of rounds to complete the scene. As with the corresponding Russian set these figures are all dressed for cold weather, and of course the campaign in the Soviet Union springs to mind as a result. Two have the regulation double-breasted greatcoat, two a hooded parka while the others have a laced camouflage smock. Clearly visible is the Feldmütze on two of the figures while the rest have helmets with cloth covers, again of camouflage material. Again working in pairs, two figures are lucky enough to be wearing the tube-like woolen balaclava, and two have short boots and anklets which appeared later in the war - the rest apparently retaining their older marching boots (there is no sign of the specialised winter footwear here). All these items of clothing are scattered about the six poses, so no two are alike, happily. The standard of sculpting on the figures is as good as anything Italeri have yet produced, which is to say largely flawless. With very good proportions and perfectly realistic folds in clothing, these are not subjects that call for much detail, but facial expressions and fine areas such as smock lacing are all beyond reproach. Without any trace of flash and with almost no excess plastic, these are once again a fine example of what Italeri can deliver when it wants to. To sum up then this is a very nice kit which does not try to emulate the highly detailed construction kits of other manufacturers, although there are possible issues with the accuracy of the gun model. 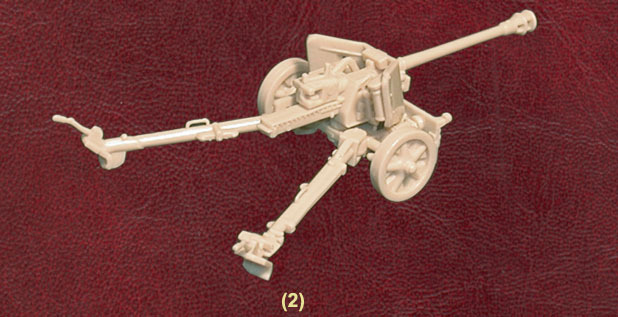 However it delivers an attractive model that is quick to build, along with some excellent figures that really give the artillery piece the life it deserves and will surely find themselves serving other guns as required. Another pleasing product from Italeri.